Volume 5 of The Churchill Documents serves as the final companion volume to the second volume of the official biography, Young Statesman, 1901-1914. 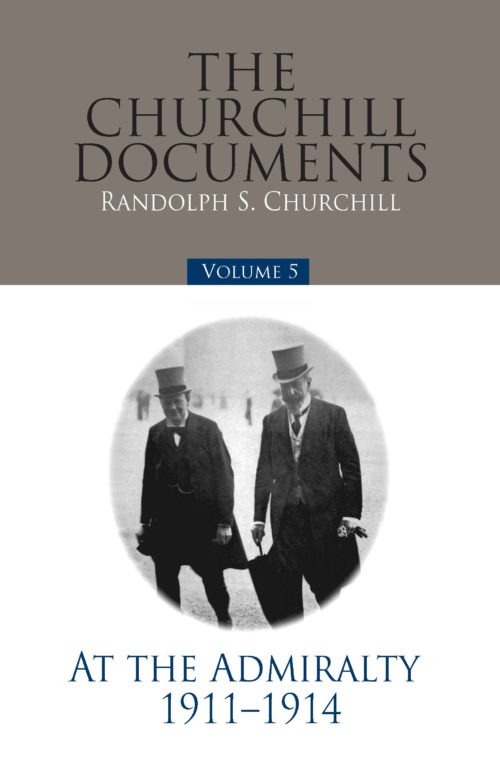 It begins with Churchill’s prominent part in the Liberal Government’s attempts to introduce Home Rule for Ireland. It continues with his spirited opposition to Votes for Women, during which he incurred the anger of the militant wing of the Suffragettes. It then covers his extraordinarily active and creative years as First Lord of the Admiralty, ensuring the ability of the Royal Navy to defend Britain and its colonies in the event of war. His letters to his wife, contained herein, provide a continuing insight into his most private feelings, including his reflections on the sinking of the Titanic. The family man is also on view during the arrival and early years of his first two children, Diana and Randolph. His wife’s anguish at the dangers of his flying lessons is also a powerful and moving motif, as he relished the new art of flying and wanted to achieve his pilot’s certificate. But following the deaths of two of his flying instructors in air accidents, he deferred to her plea to give up flying altogether. Your generous support will build an endowment to fund national conferences, student scholarships, a faculty chair, and the completion and publication of The Official Biography of Winston Churchill.